I am finally back with the product review post! Above is my current skincare routine. But I will be reviewing every single product that I've used before in this post! I filmed that more than 3 months back when I first joined IDS clinic. Hmm and maybe I will do a skincare regime video when I have the time? I rarely do videos cause my house is noisy throughout the day lols. Now, for the full review of all the products I've tried so far! I will only give a short description of the products here. They are numbered according to the labels in the photo shown earlier. It's actually also the order I use these products. Non-labelled ones means they are no longer in my skincare routine. For the full descriptions, you can find them at IDS product website. An exclusive product from IDS, the Facial Scrub contains ultra-fine crystals to effectively exfoliate dead skin cells and speed up skin turnover. This is definitely one of my favorites even though I only just started using this recently! As my skin can be a lil sensitive, I'm not allowed to use this too frequently and can only use it two to three times per week max. I love how my face becomes super smooth after each use and this smoothness can last for a few days! This all-round achiever tackles wrinkles, loss of firmness, patchy skin tone, dark spots and even acne. It has a liquid essence texture, is non-sticky and non-thick at all and really does help make your skin turn smoother! This has been one of my favorites ever since I tried it after IDS Clinic's launch! I did a detailed review of it in comparison with DRx Clinic's Max-C last time. If you are interested, you can find the post at: IDS C+ Vs DRx Max C.
This targets pores by minimizing excess oil production, thus reducing blackheads and whiteheads. Note that I'm no longer using this product. I have people asking me if IDS PORE is the same as DRx CF. To be honest, I can't really tell much of a difference except for the slight difference in texture :/ I do love how it clears my blackheads and whiteheads but just like DRx's CF, it can be a lil sticky and takes awhile for the skin to absorb fully. This treatment works to reduce redness in inflamed blemishes and acne scars while preventing further breakouts. Note that I'm no longer using this product. Another product that I am somewhat glad is not longer in my routine. I am very very very picky about products. The moment they are sticky, they will never be my favorite :/ BUT I have to say I do love how Clear cleared my face last time though. As mentioned in the video, it can tint your face so it's advised to be only used at night. But anyways there is a new formulation for Clear and it's Clear10! It's actually CLEAR but with a new formulation! I call this the godly product and is definitely one of my favorites. There's this unknown gel (not launched) that I called the "magic gel" in my Skin Evolution with IDS Clinic #2. This Clear10 feels like a mixture of that gel and Clear10. I'm not 100% sure. Just guessing only, but I got Clear10 as a replacement for that "magic gel". Clear10 works really really well, as good as that magic gel! It's brown in color but won't tint your face. It is not as sticky as the old Clear too, almost non-sticky, and gets absorbed faster than the old Clear. Plus, it works like magic! My breakout patches usually gets cleared in 5days! You can find my Clear10 before and after comparison photos at: Katelyn's Skin Evolution with IDS Clinic #3. Ideal for combination or oily skin, this increases hydration, not grease. With Vitamins C, E and moisturizing botanical extracts, it also helps fight acne and lighten acne scars. This moisturizer is one of my favorites from IDS too! I love how it can moisturize my skin but at the same time is 100% non-sticky/greasy! You know how some moisturizer can be oily right? But this is not the case! Thumbs up for it! This unique non-chemical sunscreen lotion boasts special titanium dioxide particles of a specific size. Vitamin C provides added antioxidant benefits. Another one of my favorites! Hahas I know I have many favorites lols but they are all really super good! What to do? =P Anyways, I feel no other sunscreen can beat this product! Since it comes with vitamin C so that already makes it a unique 2-in-1 product. On top of that I love how it has a high SPF of 50 but is non-sticky/oily/thick at all! All of you know how particular I am with non-sticky products and that's also why I haven't been using sunscreens frequently. But I'm glad I finally found one that suits me! Btw, I also did a detailed review of this product compared to DRx Clinic's 5B last time. If you are interested, you can find the post at: IDS S2 Vs DRx 5B. 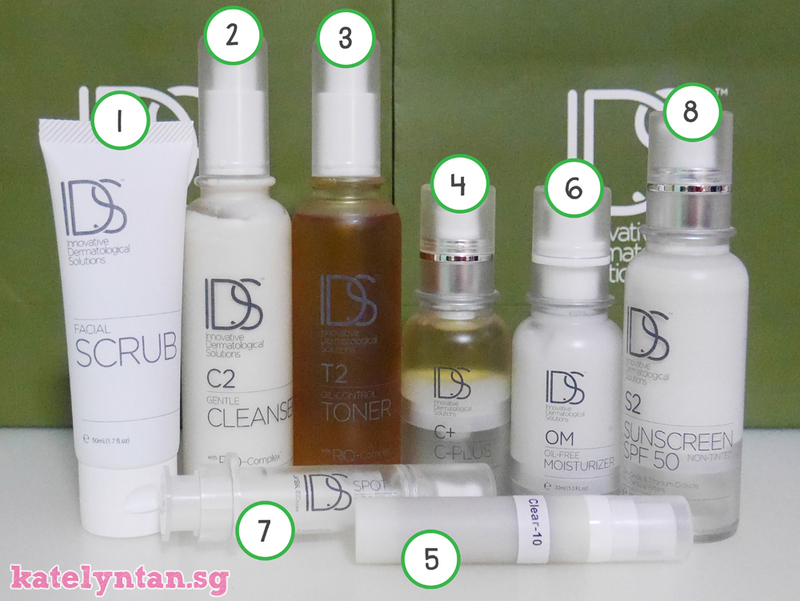 That all the 10 products from IDS Clinic that I've tried! With that, I'm finally done with the full IDS product review! They do carry more products to solve other skin issues. If you are interested, you can check the full list at IDS product website ;) I finally completed this review lols! For those who have been waiting for this review, I'm so sorry about the delay :/ Hope this review is helpful to you all. Btw, these reviews aren't everything since everyone has different skin conditions. If you would like to get their products, you will still have to visit IDS Clinic's doctors first!